This text emphasizes the relevance of research methods for the everyday lives of its readers: undergraduate students. 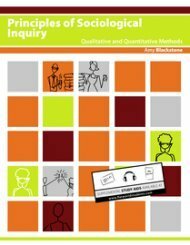 Using a variety of examples from published sociological research, this text also aims to provide balanced coverage of qualitative and quantitative approaches. This book is an accessible explanation of why the coming years will probably be the Age of Biology, and what this will mean to most every aspect of our society. Kelly is a guide who explains the implications of this rapidly evolving revolution. The book examines the popular knowledges that saturate our everyday experience. We make this information and then it shapes the way we see the world. How valid is it when compared to official knowledge and why it causes so much institutional anxiety?